I’m here to tell you that it is possible to buy regular clothes and not have to spend extra on maternity clothes, which won’t get much use ever again. When it comes to clothes, even before I was pregnant, I like to buy things that can be worn all year round, for any occasion, with any outfit. So as my belly grew, I found ways to buy clothes that I can still wear again after pregnancy, like jumpsuits, rompers, high waisted leggings, jeggings, and fitted mini dresses. I really thought being super pregnant in winter would be nice because it just meant leggings and sweaters, but I quickly learned that oversized clothes don’t flatter the bump or make me feel cute. Being really pregnant in summer would be much easier when I could just wear fitted mini dresses all the time haha. Some stores/brands I shopped at were Forever 21, Vici, Pac Sun, Billabong, Old Navy, Target, Asos, Nasty Gal, Free People, and Joe’s Jeans. And I highly suggest cute slip on Vans for when it gets hard to tie your shoes! 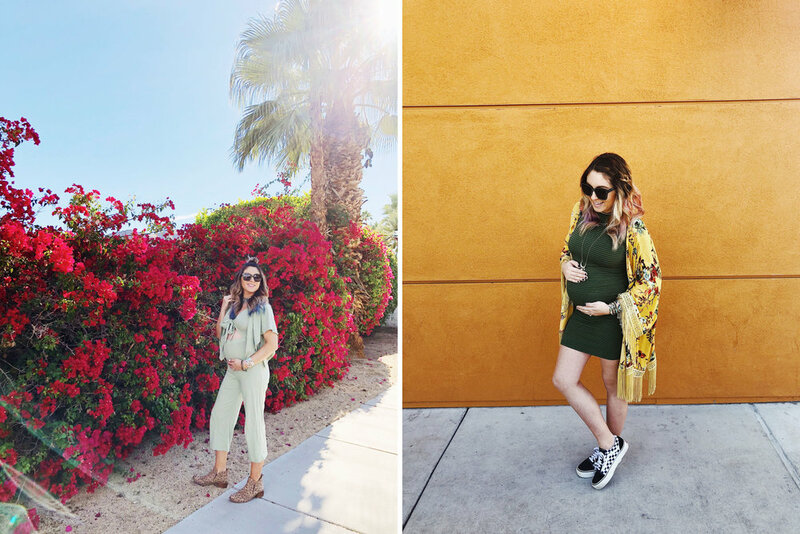 Here’s a look at some of my favorite “maternity outfits” starting from 19 weeks until last weekend.